iOS 8 beta has been out for just 2 days and it seems like it has already been jailbroken. 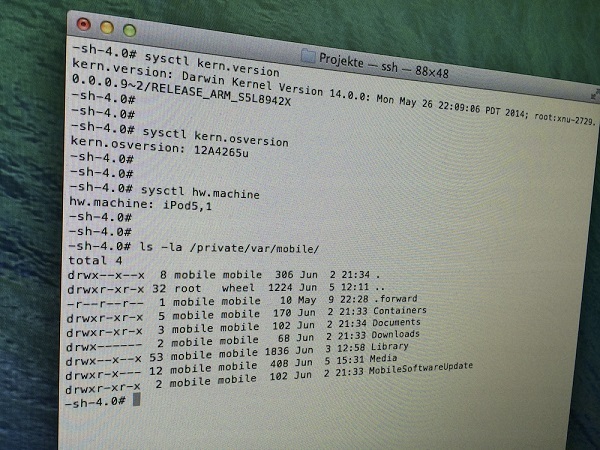 The feat has been achieved by infamous iOS hacker i0n1c who has shared a photo of SSH running on his Mac that shows a jailbroken iPod touch 5th generation. The hacker was able to access his iPod touch through SSH right from his Mac, something that requires the device to be jailbroken. Although the pictures shows that a jailbreak has been done on iOS 8 beta 1 we still don’t know whether he has been able to run Cydia on the device yet. How we know it is iOS 8 in the picture above? Due to the OS build number i.e 12A4265u. While he has successfully jailbroken the latest available iOS version it is safe to say that he is never going to release it. Just last month i0n1c showed his device running Cydia on iOS 7.1.1 but never actually released it for general public to use. Even if he wants to release the jailbreak for iOS 8 it is too early right now and other jailbreak developers will not release it as well until Apple has released it for public’s use in the fall. An early release would allow Apple to fix the vulnerability before public release. Now it would be interesting to see if jailbreak for iOS 7.1.1 is released or developers directly release it for iOS 8.